During this time of year, we all tend to get a little obsessive about getting everyone the right gift. We don’t want to waste time or money on things that our loved ones don’t want. But is it okay to give a used gift?The Northern Cheapskate thinks so! One of my most memorable gifts was something my friends picked up at a place called Diggers. It was special to me because of the thoughtfulness and the degree of difficulty they had in getting it to me. It wasn’t so much about the gift as it was that they cared enough about me to to do something extra special. I firmly believe in the fine art of regifting. Why let something sit in a closet out of guilt? Why not pass it on to someone who would enjoy it? And purchasing a used gift isn’t all that different. Most items at thrift stores and garage sales cost 10 to 20 percent of what you’d pay retail. And sometimes the items are just like new! Giving a secondhand gift can be a great money-saver for you. But unless you’re shopping from your own closet, it won’t really be a time saver. It takes a lot of thrift store shopping and garage sale hunting to take care of your shopping list this way. There is so much STUFF in this world already. It just makes good environmental sense to make do with what we already have. And when you give a used gift, there’s no excess packaging to worry about. The gift has great meaning for the recipient. People form sentimental attachments to all kinds of people, places and things. They have hobbies and interests. Figure out what those are, and chances are you can find a special secondhand gift. For example, my husband is a history buff and our home office is designed around an old 1939 map we found in the basement of our old house. Some good friends of ours framed a series of Life Magazine covers from that era. It’s now one of his favorite things about the room. The item you’re giving is rare or really hard to find. Sometimes the perfect gift just isn’t available in stores anymore! My son fell in love with Bob the Builder when he was three. Unfortunately, this was after Handy Manny entered the scene and everything Bob-related disappeared off store shelves. Santa was able to find a really cool set of 25 die-cast characters from Bob the Builder complete with carrying case on eBay for less than $40 shipped. My son adored it and never once cared that it was secondhand. The gift has been repurposed into something really cool. Turning old things into something new isn’t just environmentally friendly and money-smart. It’s cool! Dress up an old piece of furniture or turn a t-shirt collection into a quilt. Make a pair of mittens from an old sweater or upcycle a sweater into a pair of wrist warmers. Head over to Pinterest or Etsy and you’ll find tons of ideas for making old things look like something completely new and different. The gift is for a kid. Kids are fickle. Toys and gadgets can fall in and out of favor quickly. And kids are also likely to be very hard on their belongings. I’ve bought my boys second hand gifts for this very reason. When my oldest boy was 5, he was in love with Mario Kart on Wii and wanted a Nintendo 3DS. I wasn’t comfortable giving a 5-year-old a $180 toy when he couldn’t remember where his mittens were two minutes after he took them off. And it just wasn’t in my budget. So, I dug my old Game Boy Advance out of storage and found a used Mario Kart game for $10 online. He loved it and proved to me that he can take good care of video game systems. He’s since upgraded to the 3Ds, but he still loves to play the Game Boy today! This Christmas, all three boys will be getting a secondhand gift. At ages 8 and 6, they are starting to enjoy music and have been asking for MP3 players. I’m just not willing to shell out a lot of money for MP3 players until I know it is something that they will use and take care of. So I found 3 used iPod Shuffles at GameStop for just $14.99 each. That’s a huge savings over buying new, and I know they’ll love them just the same! Just make sure that if you are giving used gifts to kids that they haven’t been recalled, that they’re in working order, and that they have a return policy you can live with. You want to have a little fun with the recipient. This little wall hanging I saw at a thrift shop for $1 could make a funny gift for just the right person. One of my favorite reasons to give a used gift is to have a little fun with the recipient. Used gifts make the perfect gag gifts because you can usually find hilarious items for a steal at thrift shops. Give someone some truly hideous pants you found at Goodwill. Give the tackiest lamp you can find at a garage sale. 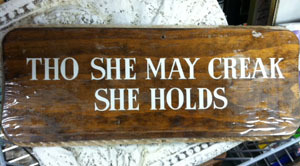 Give someone a funny wall hanging you picked up at a thrift shop. Just make sure the gift is funny, not offensive, or it could end up costing you! You can give someone a laugh as well as a memorable gift. I’ve known families who pass along the same tacky gift year after year. It’s an ongoing joke that hasn’t gotten old yet. I’m pretty upfront with people about giving a secondhand gift unless the item is so close to brand spankin’ new that no one would ever know the difference. I think it encourages others to give secondhand gifts, and who wouldn’t want to live in a world where things aren’t wasted? But I never give a used gift just to save a buck, and you shouldn’t either. Give a used gift because you’ve put some thought into it. The money you save is just gravy on top. Once I spent an inordinate amount of time picking out a birthday gift for a friend whose birthday was in October. She gave it back to me for Christmas. I didn’t say a word, but I was very hurt. I knew it was the same one, because the box had a blemish where I pulled off the price tag. I told her about it years later, and she was so embarrassed. She said she already had one, and she thought I would like one too. Rule #1 of re-gifting – Keep track of who gave you what so that doesn’t happen! I think it’s kind of sweet that she wanted you to have it… just too bad there were hurt feelings over it. Hey Christina, I love this post. I think the negative connotation that goes along with used gifting needs to go away. Especially with children as you mentioned! Anyway, thanks for the great read, I’ll see ya around! As long as it’s in acceptable condition, why not? I don’t care where the gift comes from — a store or your closet — if I know you thought about me when choosing it. Ivegotten some great stuff at yard sales for gifts, like the Star Wars Trivial Pursuit for $5. Barely used and well-received by my husband!